Casino Party People is an entertainment service business providing Blackjack, Craps, Roulette and Poker tables. 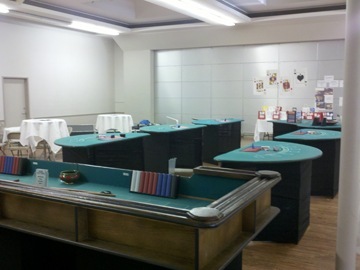 Our services included table rentals, playing equipment and dealers for three hours. Remember that we do not play for real money and all gaming is for entertainment only. Becaueluse we are not dealing with money, it is O.K. For all ages to play, can be a family friendly event. We have been providing fundraiser services since 2005. A perk of our services is we will, at no extra charge, attend one committee meeting for your non-profit fundraiser. Your committee meeting gives us the opportunity to present casino parties as a fundraiser opportunity, where we can answer the questions for everybody at one time. Because you will have lots of questions. Other activities are at the same event? 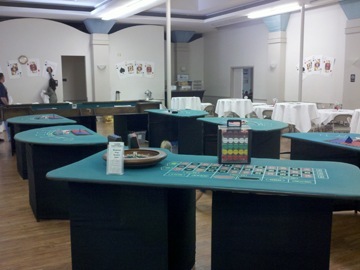 If there is an auction or raffle Casino Party People will provide a free table voucher to sell or Raffle. Contact us to schedule an appearance at your fundraiser committee meeting.